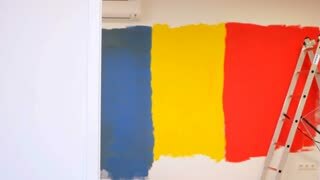 Search Results for "painting wall"
Male painting walls around windows. Young man in new apartment painting walls before moving in. 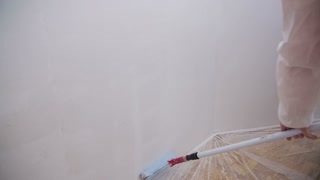 Painting walls with special mixture in slow motion. 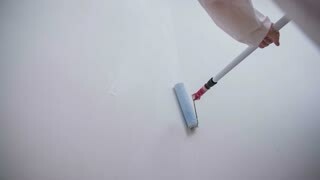 Slow motion shot of person in protective white suit painting walls with paint roller on pole. Female person painting walls low angle shot. Slow motion shot of person in protective white suit painting walls with paint roller on pole. Person in protective suit painting walls with paint roller. 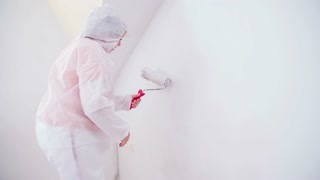 Slow motion wide shot of person in white protective suit with hood going up and down with paint roller painting walls. 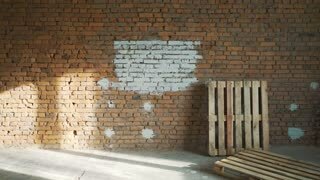 A young girl paints a brick wall in her house with a roller. Painting walls with a roller. 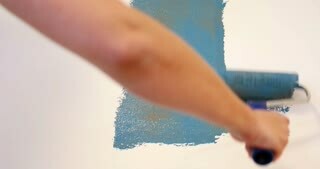 Paint the bare walls with a roller of white paint. 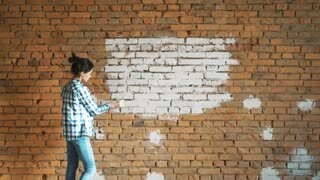 Women painting wall with paint roller in slow motion. Wide shot of female in protective white suit painting home walls alone. 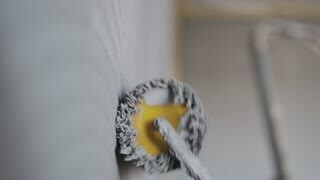 Close-up of female hand painting interior wall with paint roller while renovating new apartment. Low angle view. Young diy woman renewing interior design of new residential building and painting wall. Excited laughing multiracial homeowners renovating their interior design, doing home improvement and renewal together in new empty apartment while painting wall with paint rollers. Side view of overjoyed singing mixed race couple painting wall with paint rollers while doing renovation of new apartment. Positive young homeowners rejoicing renewing design together in new house. Chatting cheerful married caouple in casual clothes decorating room in new home painting wall together using paint rollers. Positive couple making home makeover and renovation of new appartment. Up and down with paint roller. 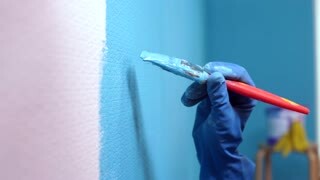 Slow motion close up of person painting walls with fresh paint. Cheerful young married couple painting new house interiors using paint rollers during renovation. Happy joyful mixed race spouses decorating room in new home painting wall together. Side view of renovation diy couple painting interior wall and fighting with paint rollers. Smiling pretty mixed race woman in casual clothes renovating wall in new appartment applying paint. 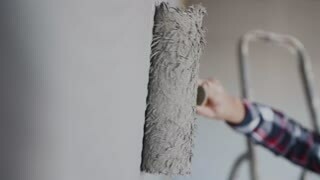 Beautiful chatting mixed race woman with paint roller painting wall with male hand with paintbrush applying white color on wall in foreground while multiracial couple renewing home interior design. Happy positive couple relaxing after painting wall in new apartment and eating pizza. Smiling young woman resting on lap of beloved man, chatting, having snack while renovating home interior design. Woman roll out plastic foil to cover furniture. Person preparing for painting walls, protecting sleeping bed with thin plastic foil. Parquet flooring protect with plastic foil. Wide low angle of woman preparing room for painting walls. Dressed in protective white suit. Shoot in slow motion. 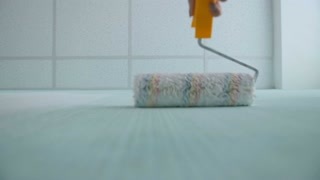 Paint roller going up and down in slow motion. 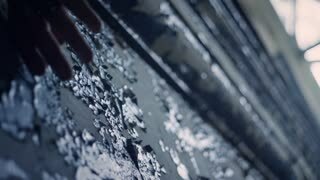 Person painting walls with paint roller in slow motion. Diy couple making home improvement, renewing interior design in new house. Lovely woman with paintbrush sitting on stepladder while man painting wall with paint roller during renovation of new home. Carefree married couple renovaiting their house and painting wall with paint roller together. Lovely mixed race woman doing home makeover with white color while piggybacking her beloved smiling man.